Free! Quick Prep Signs to anchor your anchor charts!! Over 30 signs for flexible use! 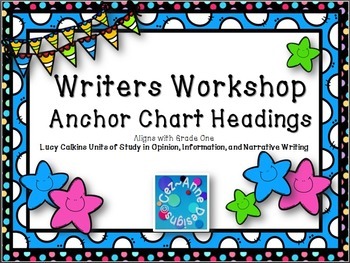 ~ Use signs as headings to your anchor charts, keep at easel during specific units. ~ Post signs at your writing center for reference. The anchor chart signs/ headings align with Lucy Calkins Units of Study in Opinion, Information, and Narrative Writing* Grade One. The highlight points/ phrases can be used to introduce and manage ideas over various bends in the units. Although the signs/ headings focus primarily on Grade One, some can be useful in the other grades, as they support the program's main ideas. These signs/ headings support most writers workshop models as they celebrate good writing practice! For long-lasting use, print on cardstock and laminate! After downloading, please return to my store and leave feedback!